RD Sharma Solutions for Class 8 Math Chapter 17 Understanding Shapes Iii (special Types Of Quadrilaterals) are provided here with simple step-by-step explanations. These solutions for Understanding Shapes Iii (special Types Of Quadrilaterals) are extremely popular among class 8 students for Math Understanding Shapes Iii (special Types Of Quadrilaterals) Solutions come handy for quickly completing your homework and preparing for exams. All questions and answers from the RD Sharma Book of class 8 Math Chapter 17 are provided here for you for free. You will also love the ad-free experience on Meritnation’s RD Sharma Solutions. All RD Sharma Solutions for class 8 Math are prepared by experts and are 100% accurate. Can the following figures be parallelograms. Justify your answer. (i)No. This is because the opposite angles are not equal.(ii)Yes. This is because the opposite sides are equal. (ii)No, This is because the diagonals do not bisect each other. In the adjacent figure HOPE is a parallelogram. Find the angle measures x,y and z. State the geometrical truths you use to find them. In the following figures GUNS and RUNS are parallelograms. Find x and y. In the following figure RISK and CLUE are parallelograms. Find the measure of x. Two opposite angles of a parallelogram are (3x − 2)° and (50 − x)°. Find the measure of each angle of the parallelogram. If an angle of a parallelogram is two-third of its adjacent angle, find the angles of the parallelogram. Two adjacent angles of a parallelogram add up to 180°.Let x be the angle.∴ x+2x3=180°5x3==180°x=72°2x3=2×72°3=108°Thus, two of the angles in the parallelogram are 108° and the other two are 72°. The measure of one angle of a parallelogram is 70°. What are the measures of the remaining angles? Given that one angle of the parallelogram is 70°.Since opposite angles have same value, if one is 70°, then the one directly opposite will also be 70°.So, let one angle be x°.x°+70°=180° (the sum of adjacent angles of a parallelogram is 180° )x°=180°-70°x°=110°Thus, the remaining angles are 110°, 110° and 70°. Two adjacent angles of a parallelogram are as 1 : 2. Find the measures of all the angles of the parallelogram. Let the angle be A and B.The angles are in the ratio of 1:2.Measures of ∠A and ∠B are x° and 2x°.Then, ∠C=∠A and ∠D=∠B (opposite angles of a parallelogram are congruent)As we know that the sum of adjacent angles of a parallelogram is 180°.∴ ∠A+∠B=180°⇒x°+2x°=180°⇒3x°=180°⇒x°=180°3=60°Thus, measure of ∠A=60°, ∠B=120°, ∠C=60° and ∠D=120°. 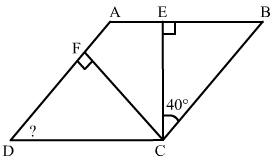 In a parallelogram ABCD, ∠D = 135°, determine the measure of ∠A and ∠B. ABCD is a parallelogram in which ∠A = 70°. Compute ∠B, ∠C and ∠D. The sum of two opposite angles of a parallelogram is 130°. Find all the angles of the parallelogram. Let the angles be A, B, C and D.It is given that the sum of two opposite angles is 130°.∴ ∠A+∠C=130°∠A+∠A=130° opposite angles of a parallelogram are same∠A=65°and ∠C=65°The sum of adjacent angles of a parallelogram is 180°.∠A+∠B=180°65°+∠B=180°∠B=180°-65°∠B=115° ∠D=115°∴ ∠A=65°, v∠B=115°, ∠C=65° and ∠D=115°. All the angles of a quadrilateral are equal to each other. Find the measure of each. Is the quadrilateral a parallelogram? What special type of parallelogram is it? Let the angle be x.All the angles are equal.∴ x+x+x+x=360°4x=360°x=90°So, each angle is 90° and quadrilateral is a parallelogram. It is a rectangle. Two adjacent sides of a parallelogram are 4 cm and 3 cm respectively. Find its perimeter. The perimeter of a parallelogram is 150 cm. One of its sides is greater than the other by 25 cm. Find the length of the sides of the parallelogram. Opposite sides of a parallelogram are same.Let two sides of the parallelogram be x and y.Given: x=y+25Also, x+y+x+y=150 (Perimeter= Sum of all the sides of a parallelogram)y+25+y+y+25+y=1504y=150-504y=100y=1004=25∴ x=y+25=25+25=50 Thus, the lengths of the sides of the parallelogram are 50 cm and 25 cm. The shorter side of a parallelogram is 4.8 cm and the longer side is half as much again as the shorter side. Find the perimeter of the parallelogram. Two adjacent angles of a parallelogram are (3x − 4)° and (3x + 10)°. Find the angles of the parallelogram. We know that the adjacent angles of a parallelogram are supplementry.Hence, 3x+10° and 3x-4° are supplementry.3x+10°+3x-4°=180°6x°+6°=180°6x°=174°x=29°First angle = 3x+10°=3×29°+10°=97°Second angle = 3x-4°=83°Thus, the angles of the parallelogram are 97°, 83°, 97° and 83°. ∠DAB, ∠ADC, ∠BCD, ∠AOD, ∠DOC, ∠BOC, ∠AOB, ∠ACD, ∠CAB, ∠ADB, ∠ACB, ∠DBC and ∠DBA. The angle between the altitudes of a parallelogram, through the same vertex of an obtuse angle of the parallelogram is 60°. Find the angles of the parallelogram. In Fig. 17.28, ABCD and AEFG are parallelograms. If ∠C = 55°, what is the measure of ∠F? In Fig. 17.29, BDEF and DCEF are each a parallelogram. Is it true that BD = DC? Why or why not? In Fig. 17.29, suppose it is known that DE = DF. Then, is ΔABC isosceles? Why or why not? In ∆FDE:DE=DF ∴ ∠FED=∠DFE.............(i) (angles opposite to equal sides)In the IIgm BDEF: ∠FBD= ∠FED.......(ii) (opposite angles of a parallelogram are equal)In the IIgm DCEF:∠DCE=∠DFE......(iii) (opposite angles of a parallelogram are equal)From equations (i), (ii) and (iii):∠FBD=∠DCEIn △ABC:If ∠FBD=∠DCE, then AB=AC (sides opposite to equal angles).Hence, △ABC is isosceles. Now, state if XY is bisected at O. (i) Diagonals of a parallelogram bisect each other. So, XY is bisected at O. (i) True, since opposite angles of a parallelogram are equal. (ii) True, as AF is the bisector of ∠A. (iii) True, as CE is the bisector of ∠C. 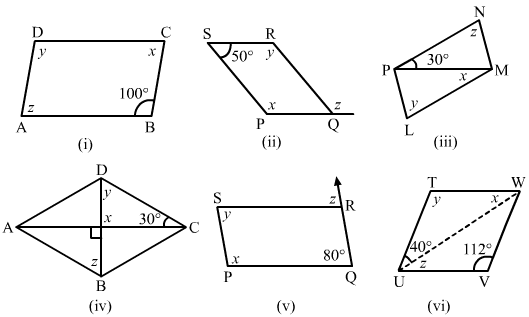 (v) True, as corresponding angles are equal (∠CEB = ∠FAB). 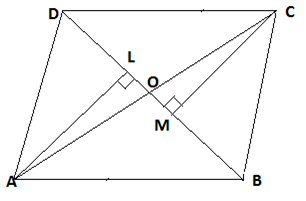 Diagonals of a parallelogram ABCD intersect at O. AL and CM are drawn perpendiculars to BD such that L and M lie on BD. Is AL = CM? Why or why not? Points E and F lie on diagonal AC of a parallelogram ABCD such that AE = CF. What type of quadrilateral is BFDE? In the IIgm ABCD:AO=OC......(i) (diagonals of a parallelogram bisect each other)AE=CF.......(ii) (given)Subtracting (ii) from (i):AO-AE=OC-CFEO=OF......... (iii)In ∆DOE and ∆BOF:EO=OF (proved above)DO=OB (diagonals of a parallelogram bisect each other)∠DOE =∠BOF (vertically opposite angles)By SAS congruence: ∆DOE≅ ∆BOF∴ DE=BF (c.p.c.t)In ∆BOE and ∆DOF:EO=OF (proved above)DO=OB (diagonals of a parallelogram bisect each other)∠DOF =∠BOE (vertically opposite angles)By SAS congruence: ∆DOE≅ ∆BOF∴ DF=BE (c.p.c.t)Hence, the pair of opposite sides are equal. Thus, DEBF is a parallelogram. In a parallelogram ABCD, AB = 10 cm, AD = 6 cm. The bisector of ∠A meets DC in E, AE and BC produced meet at F. Find te length CF. Which of the following statements are true for a rhombus? (i) It has two pairs of parallel sides. (ii) It has two pairs of equal sides. (iii) It has only two pairs of equal sides. (iv) Two of its angles are at right angles. (v) Its diagonals bisect each other at right angles. (vi) Its diagonals are equal and perpendicular. (vii) It has all its sides of equal lengths. (viii) It is a parallelogram. (ix) It is a quadrilateral. (x) It can be a square. (xi) It is a square. Diagonals of a rhombus are perpendicular, but not equal. It is a parallelogram because it has two pairs of parallel sides. It is a quadrilateral because it has four sides. It can be a square if each of the angle is a right angle. It is not a square because each of the angle is a right angle in a square. (iii) A rhombus has all its sides of ...... length. (iv) The diagonals of a rhombus ...... each other at ...... angles. (i) A rhombus is a parallelogram in which adjacent sides are equal. (ii) A square is a rhombus in which all angles are right angled. (iii) A rhombus has all its sides of equal length. (iv) The diagonals of a rhombus bisect each other at right angles. (v) If the diagonals of a parallelogram bisect each other at right angles, then it is a rhombus. The diagonals of a parallelogram are not perpendicular. Is it a rhombus? Why or why not? No, it is not a rhombus. This is because diagonals of a rhombus must be perpendicular. The diagonals of a quadrilateral are perpendicular to each other. Is such a quadrilateral always a rhombus? If your answer is 'No', draw a figure to justify your answer. No, it is not so. Diagonals of a rhombus are perpendicular and bisect each other. Along with this, all of its sides are equal. In the figure given below, the diagonals are perpendicular to each other, but do not bisect each other. ABCD is a rhombus. If ∠ACB = 40°, find ∠ADB. If the diagonals of a rhombus are 12 cm and 16cm, find the length of each side. All sides of a rhombus are equal in length.The diagonals intersect at 90° and the sides of the rhombus form right triangles.One leg of these right triangles is equal to 8 cm and the other is equal to 6 cm.The sides of the triangle form the hypotenuse of these right triangles.So, we get:(82+62)cm2=(64+36)cm2=100 cm2The hypotneuse is the square root of 100cm2. This makes the hypotneuse equal to 10.Thus, the side of the rhombus is equal to 10 cm. Construct a rhombus whose diagonals are of length 10 cm and 6 cm. 1. Draw AC equal to 10 cm. 2. Draw XY, the right bisector of AC, meeting it at O.
i.e. 3 cm, cut OB = OD = 3 cm. 4. Join AB, AD and CB, CD. Draw a rhombus, having each side of length 3.5 cm and one of the angles as 40°. 1. Draw a line segment AB of 3.5 cm. 2. Draw ∠BAX equal to 40°. 3. With A as centre and the radius equal to AB, cut AD at 3.5 cm. 4. With D as centre, cut an arc of radius 3.5 cm. 5. With B as centre, cut an arc of radius 3.5 cm. This arc cuts the arc of step 4 at C.
6. Join DC and BC. One side of a rhombus is of length 4 cm and the length of an altitude is 3.2 cm. Draw the rhombus. 1. Draw a line segment AB of 4 cm. 2. Draw a perpendicular XY on AB, which intersects AB at P.
3. With P as centre, cut PE at 3.2 cm. 4. Draw a line WZ that passes through E. This line should be parallel to AB. 5. With A as centre, draw an arc of radius 4 cm that cuts WZ at D.
6. With D as centre and radius 4 cm, cut line DZ. Label it as point C.
4. Join AD and CB. Draw a rhombus ABCD, if AB = 6 cm and AC = 5 cm. 1. Draw a line segment AC of 5 cm. 2. With A as centre, draw an arc of radius 6 cm on each side of AC. 3. With C as centre, draw an arc of radius 6 cm on each side of AC. These arcs intersect the arcs of step 2 at B and D.
4. Join AB, AD, CD and CB. ABCD is a rhombus and its diagonals intersect at O. (i) Is ∆BOC ≅ ∆DOC? State the congruence condition used? (ii) Also state, if ∠BCO = ∠DCO. Show that each diagonal of a rhombus bisects the angle through which it passes. In ∆AED and ∆DEC: AE=EC (diagonals bisect each other)AD=DC (sides are equal)DE=DE (common)By SSS congruence: ∆AED≅ ∆CED∠ADE=∠CDE (c.p.c.t)Similarly, we can prove ∆AEB and ∆BEC, ∆BEC and ∆DEC, ∆AED and ∆AEB are congruent to each other.Hence, diagonal of a rhombus bisects the angle through which it passes. ABCD is a rhombus whose diagonals intersect at O. If AB = 10 cm, diagonal BD = 16 cm, find the length of diagonal AC. The diagonals of a quadrilateral are of lengths 6 cm and 8 cm. 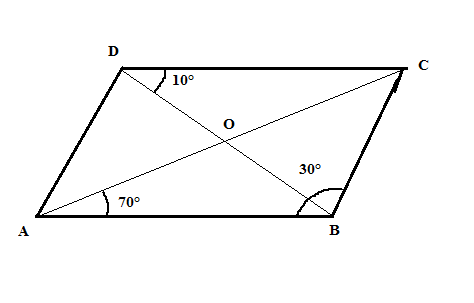 If the diagonals bisect each other at right angles, what is the length of each side of the quadrilateral? Let the given quadrilateral be ABCD in which diagonals AC is equal to 6 cm and BD is equal to 8 cm.Also, it is given that the diagonals bisect each other at right angle, at point O.∴ AO=OC=12AC=3 cmAlso, OB=OD=12BD=4 cmIn right △AOB:AB2=OA2+OB2⇒AB2=(9+16) cm2⇒AB2=25 cm2⇒AB=5 cmThus, the length of each side of the quadrilateral is 5 cm. Which of the following statements are true for a rectangle? (i) It has two pairs of equal sides. (ii) It has all its sides of equal length. (iii) Its diagonals are equal. (iv) Its diagonals bisect each other. (v) Its diagonals are perpendicular. (vi) Its diagonals are perpendicular and bisect each other. (vii) Its diagonals are equal and bisect each other. (viii) Its diagonals are equal and perpendicular, and bisect each other. (ix) All rectangles are squares. (x) All rhombuses are parallelograms. (xi) All squares are rhombuses and also rectangles. (xii) All squares are not parallelograms. The diagonals are not perpendicular to each other. All sides are not equal. Which of the following statements are true for a square? (i) It is a rectangle. (iii) Its diagonals bisect each other at right angle. (iv) Its diagonals are equal to its sides. This is because the hypotenuse in any right angle triangle is always greater than its two sides. (i) A rectangle is a parallelogram in which each angle is a right angle. (ii) A square is a rhombus in which each angle is a right angle. (iii) A square is a rectangle in which the adjacent sides are equal. A window frame has one diagonal longer than the other. Is the window frame a rectangle? Why or why not? No, since diagonals of a rectangle are equal. 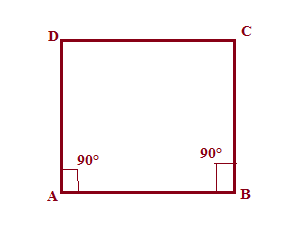 In a rectangle ABCD, prove that ∆ACB ≅ ∆CAD. Hence, by SSS criterion, it is proved that ∆ACB≅∆CAD. The sides of a rectangle are in the ratio 2 : 3, and its perimeter is 20 cm. Draw the rectangle. Let the side be x cm and y cm.So, we have: 2x+y=20 Sides are in the ratio 2:3.∴ y=3x2Putting the value of y:2x+3x2=20 2x+3x2=105x=20x=4∴ y=3×42=6Thus, sides of the rectangle will be 4 cm and 6 cm.ABCD is the rectangle having sides 4 cm and 6 cm. The sides of a rectangle are in the ratio 4 : 5. Find its sides if the perimeter is 90 cm. Let the side be x cm and y cm.So, we have: 2x+y=90 Sides are in the ratio 4:5.∴ y=5x4Putting the value of y:2x+5x4=90 4x+5x4=459x=180x=20∴ y=5×204=25Thus, the sides of the rectangle will be 20 cm and 25 cm. 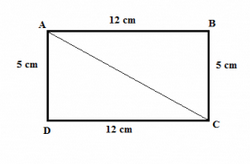 Find the length of the diagonal of a rectangle whose sides are 12 cm and 5 cm. Using Pythagoras theorem:AD2+DC2=AC252+122=AC225+14=AC2169=AC2AC=169=13 cmThus, length of the diagonal is 13 cm. Draw a rectangle whose one side measures 8 cm and the length of each of whose diagonals is 10 cm. (i) Draw a side AB, equal to 8 cm. (ii) With A as the centre, draw an arc of length 10 cm. (iii) Draw ∠ABX = 90°, which intersects the arc at C.
(v) With C as the centre, draw an arc of length 8 cm. Thus, ABCD is the required rectangle. Draw a square whose each side measures 4.8 cm. (i) Draw side AB=4.8 cm. 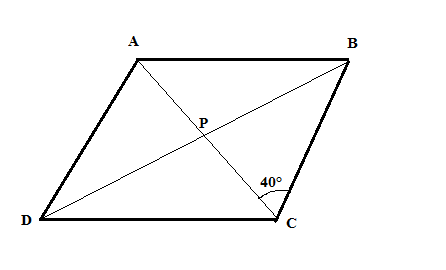 (ii) From A, make an angle of 90° and cut it at 4.8 cm and mark it point D.(iii) From B, make an angle of 90° and cut it at 4.8 cm and mark it point C.(iv) Join C and D.Thus, ABCD is the required square. 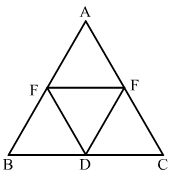 (i) If all four sides are equal, then it can be either a square or a rhombus. (ii) All four right angles, make it either a rectangle or a square. (i) Since a square has four sides, it is a quadrilateral. (ii) Since the opposite sides are parallel and equal, it is a parallelogram. (iii) Since the diagonals bisect each other and all the sides are equal, it is a rhombus. 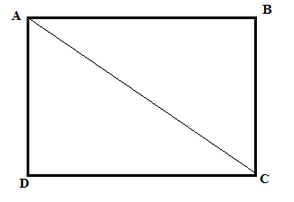 (iv) Since the opposite sides are equal and all the angles are right angles, it is a rectangle. ABC is a right-angled trianle and O is the mid-point of the side opposite to the right angle. 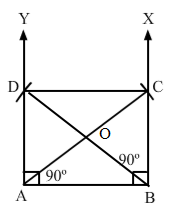 Explain why O is equidistant from A, B and C.
A mason has made a concrete slab. He needs it to be rectangular. In what different ways can he make sure that it is rectangular? (i) By measuring each angle - Each angle of a rectangle is 90°. (ii) By measuring the length of the diagonals - Diagonals of a rectangle are equal. (iii) By measuring the sides of rectangle - Each pair of opposite sides are equal. 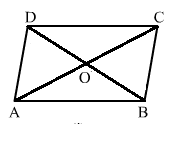 Given below is a parallelogram ABCD. Complete each statement along with the definition or property used. The following figures are parallelograms. Find the degree values of the unknowns x, y, z.